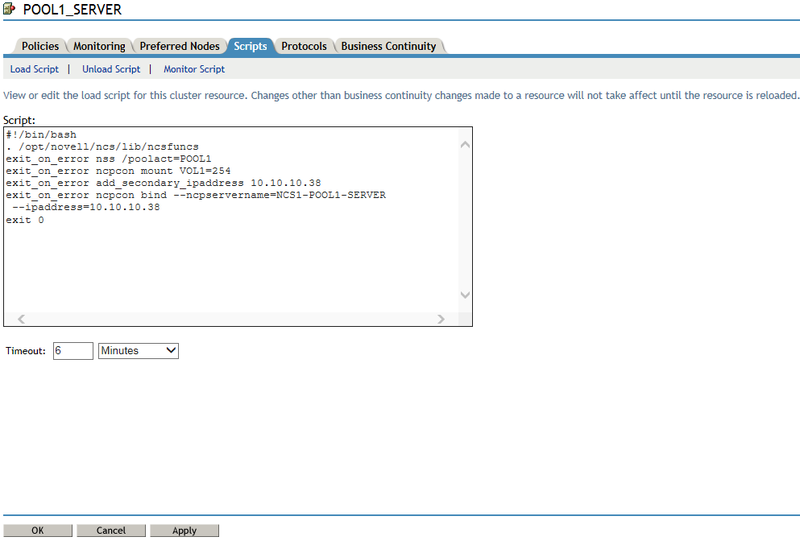 One way to set up the DST pool cluster resource is to cluster-enable both pools to create separate cluster resources. You copy the commands from the secondary pool resource scripts to the primary pool resource scripts in the proper load and unload order. The primary pool cluster resource manages the two pools and volumes. You can copy and paste the lines of code you need from one script to the other. The NCP Server object’s name for the secondary volume is automatically renamed to use the cluster name instead of the node hostname. In a migration scenario, you can later remove the shadow relationship and start using the secondary pool immediately as an independent pool cluster resource. Ensure that the volume ID on the volume is unique across all nodes. The static IP address that is assigned to the secondary cluster pool resource is consumed but not used while the pool is in the shadow relationship. The secondary cluster pool resource appears with a status of Offline and is not used. IMPORTANT:After you modify the primary pool cluster resource, you use this resource to manage the secondary pool and volume. Do not bring the secondary resource online. For this method, you need two NSS volumes, each in its own clustered-enabled pool. For instructions for creating the clustered pools and the NSS volumes, see Configuring and Managing Cluster Resources for Shared NSS Pools and Volumes in the OES 2015 SP1: Novell Cluster Services for Linux Administration Guide. When the primary volume has a state of Shadowed, its NCP volume ID represents the DST shadow volume pair of volumes. A second NCP volume ID is not assigned to the secondary volume while it is in the shadow volume relationship. You use only the ID on the primary volume in the ncpcon mount command in the cluster resource load script. IMPORTANT:In the cluster load and unload scripts, the add_secondary_ipaddress and del_secondary_ipaddress commands refer to the cluster resource’s IP address that is “secondary” to the node’s IP address. It is not related to the DST volume’s terminology. After you create two clustered pools, view the scripts. Each of the two NSS pool cluster resources has its own set of load, unload, and monitor scripts. Save the script information for the secondary pool to a text file. You can view the scripts for only one server at a time in the browser. View the properties of each resource in separate browsers to compare the scripts side-by-side. The following are sample load and unload scripts for the ARCPOOL1-SERVER resource for the secondary clustered pool named ARCPOOL1. Copy information from the secondary resource’s scripts into a text file, and save the file. You will work from this copy to add lines to the primary pool cluster resource. Continue with Section 15.4.3, Adding Commands for the Secondary Clustered Pool and Volume to the Primary Pool Cluster Resource. The clustered DST shadow volume is defined and managed in the primary pool cluster resource. You must add lines from the secondary pool cluster resource scripts and modify the mount command to define the DST shadow volume. Offline the primary cluster resource. The secondary cluster resource should still be offline. Add a line to activate the secondary pool before the primary pool activation. Add the shadow volume mount command to the primary load script. This line provides the primary volume, and assigns the secondary volume to shadow the primary. If you are using shadowfs to provide the merged file tree view for SMB/CIFS users or for Linux services like rsync, you must allow time in the load script after mounting the shadow volume to allow shadowfs to become active before continuing. Copy the pool deactivation command from the secondary pool’s unload script into the primary pool’s unload script after the line to deactive the primary pool. IMPORTANT:Ensure that you deactivate the primary pool before deactivating the secondary pool. Copy the pool status check command from the secondary pool’s monitor script into the primary pool’s monitor script before the line to check the status of the primary pool. Leave the secondary resource offline. The primary cluster resource is Running. The secondary cluster resource is reported as Offline because you are managing that cluster resource through the primary load script.